After waking to find herself in an eerie and unfamiliar place, Sophie sets out to free tormented creatures, overcome dangers and discover if this is real or just a nightmare! Dive into a breathtaking match-3 adventure as you find your path through the cursed labyrinth and fight the dark forces that appose all who enter. 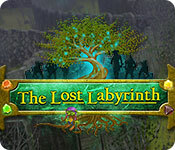 The Lost Labyrinth is rated 3.2 out of 5 by 11. Rated 5 out of 5 by denniann2 from a game i would play again not many games i would play more than once but this one is. you earn power-ups and when you use them they recharge while you continue playing and making matches. some of the higher level you have to use stragedy to finish and that is sometimes hard to figure out but i finished it and am ready to go again. you can update the power-ups with coins that you uncover underneath the tiles. i think there were 110 levels. Rated 5 out of 5 by verimeri from good fun game After reading some of the reviews I was hesitant to try this game but I am glad I did. The idea is to recreate runestones for each of the characters until you fight death. I played on relaxed since I do not care for timed or limited moves but those choices are available if you like them. I very much enjoyed the gameplay. I had no issues with it at all. There are 120 levels so it is not a short game. Rated 5 out of 5 by pennmom36 from BEAUTIFUL MATCH 3 WITH AN INTERESTING STORYLINE Sophia woke up dazed and confused. She didn't know where she was or how she had gotten there. She meets a blind gypsy who explains that she in in a spiritual plane somewhere between life and death. Together Sophia and Leonora help each other as they try to escape this life draining world, one Match at a time! You can play this game in a Relaxed, Limited Moves or Limited Time mode, and then you can choose a Casual or Expert mode within that will give you more or less obstacles and power-ups. Making matches over gold tiles will give you coins to purchase more power-ups, but you don't necessarily need to make matches over all of the gold tiles, you just need to meet the goal requirements of making a specific number of a specific tile. There are Obstacles to overcome, Bushes require a match next to them, Vines require a match under them, Rocks require two matches, Skulls and Thorns can multiply, an Metal obstacles require three matches to destroy. There are Power-ups you can purchase such as a Dagger that destroys 1 chosen tile, Shears destroy one chosen Bush, Thorn or Vine, a Hammer destroys a chosen rock or metal, Whirlwinds shuffle 50% of the tiles, Dreamcatchers destroy one skull, and a Black Hole destroys 50% of all tokens of one type. Large matches will earn Power-ups on the board, a Match 4 will create a bonus that destroys tiles in all diagonals, a Match 5 creates a bonus that destroys all tiles in a column or row, and a Match 5 or more in an L or T formation will create a bonus that destroys tiles in a row and column. I really enjoyed playing the Match 3 game, and honestly, I think I may have enjoyed this game more than Lauraville 6 which was also offered today, enjoy! 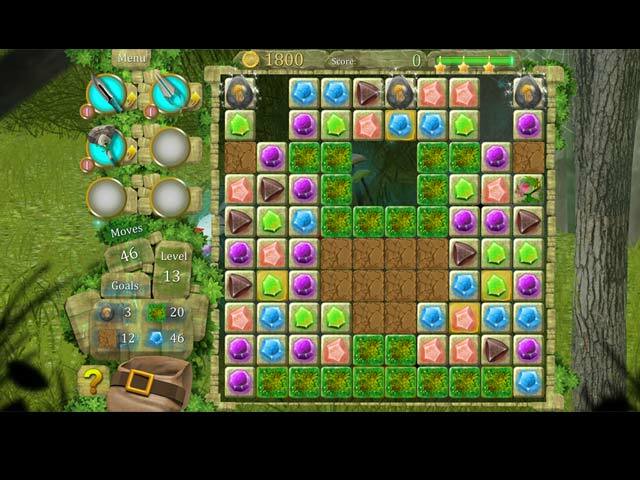 Rated 4 out of 5 by fredandethel from Nice little time passer Compared with other Green Sauce games, particularly Tales of the Orient the Rising Sun, this is a simple game, but collecting the coins with which you can buy more moves is a bit of an extra and the bonus which takes out an X shape of tiles is fun. Rated 3 out of 5 by LunaNik from Not much to distinguish it from 1000 other M3 games. 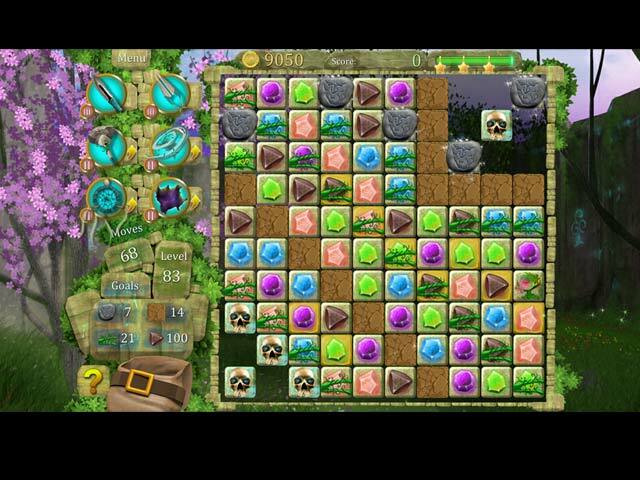 It's typical of the genre, with gems being the pieces, special pieces created when you match four or more, gradually increasing difficulty with the introduction of obstacles, and power-ups all wrapped in a basic storyline. The graphics are decent, with the exception of the loading screens being pixellated, and the music isn't annoying. The storyline is fanciful with clearly defined goals for each level and section. And you can choose from three play levels, including relaxed, which is available immediately. If you happen to be a fan of this genre, I recommend you try the demo. Rated 3 out of 5 by brimaz from IT'S AN OK GAME It's not much different from a hundred other match-3 games, but it's ok, probably better for beginners than experienced players. The challenges seem to become just a little more difficult with each level, so probably it will become more interesting after about 30 or so levels. The story line is quite good, but as that's a by-line to the actual game, it really doesn't add much to the enjoyment. Rated 3 out of 5 by JessF from On the Fence - To Buy or Not To Buy Not sure about this one. The pros and cons just about balance each other out. Pros: Wonderful, smooth movement. You can make matches while stones are dropping. Good playing choices - Casual, timed or limited moves Decent graphics Cons: Every board has to be 'loaded'. Story is told by conversation between 2 characters. That's OK, but you had to click in two different places to move the story along. I did not care for the characters. Why are all women portrayed wearing low-cut bustiers? I played on Casual - so I have no idea how difficult it will get. I have not decided whether to use a coupon or not. I suppose I could skip the dialog thus avoiding the characters. As always - try it for yourself. Rated 2 out of 5 by pennypops from Disappointing and Boring. Been waiting for BF to launch this game as I was unable to get it to run properly on other sites. Got it today and same problem. but from what little I was able to play it looks pretty boring and dated. Dont think it was worth the wait. Graphics are poor, music is dull and the story Ive seen a million times before. Just a below average match 3 you could get on any of the free game sites. Rated 1 out of 5 by Pandashie from could have been much more fun.....IF This would be a nice game for someone who's looking for a little challenge but a NIGHTMARE for those of us who prefer a relaxing experience in relaxed mode!!! No sooner were the vines broken than they grew back! I play match-3's to get away from stress- not to be frustrated if I don't make matches fast enough! A thrilling match-3 adventure where you need to escape an eerie labyrinth and determine if this is real or a nightmare.